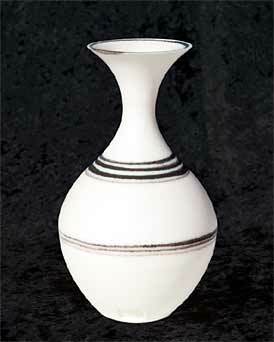 Delan Cookson flared white bottle vase - 7" (177 mm) high. Delan Cookson was born in 1937. After training at Bournemouth College of art under David Ballantyne and the Central School of Art, London, under Harding Green, he went on to work for Ruth Duckworth at Kew in 1956. In the early 1960s he started to teach at the High Wycombe College of Higher Education in Buckinghamshire, and continued to do so for no less than twenty-eight years. The family then moved to St Buryan, a charming village not far from Land's End in Cornwall. Here he was able to build a large workshop where he could pursue a full-time occupation as a potter using his own equipment on his own premises. After fourteen successful years near the toe of Cornwall he moved to Hayle, possibly the most important English town during the industrial revolution. Indeed it remained an important industrial town and port until the mid-twentieth century, and has a rich history of achievement. Richard Trevithick's association with Harvey's Foundry in Hayle led not only to steam railways, but to every kind of use of steam engines in manufacturing, mining and excavation. Now there is no heavy industry to be found in Hayle, nor great ships; just a small fishing fleet. It is a stone's throw from St Ives, and also like that town and nearby Newlyn was a centre for artists. Hayle copper-work was a product of the Arts and Crafts movement, and is now keenly sought by collector's. Delan's workshop overlooks Hayle Estuary; one of the most peaceful locations you could wish to find. He uses two electric kilns to fire his work which is now exclusively in porcelain. He speaks of his potting career as being divided into three distinct periods. The first he calls 'hard edge'; cylindrical, conical and spherical shapes that were thrown and turned. The second - a very interesting period - was concerned with the relationship of 'hard' and 'soft'. These sculptural pieces often portrayed mechanical equipment squashing or extruding something soft or delicate; a large press, for instance, squeezing a jelly. These pieces were large and hand-built from slabbed stoneware. The third and current period is finely thrown porcelain vases, bottles and bowls. He is most widely known nowadays for his brilliant clear blue glaze; a barium/lithium recipe with a small amount of copper carbonate to produce the blue colour. It is semi-translucent and is sprayed so that varying thickness can be achieved to give greater or lesser depth of colour and allowing the white porcelain body to add brilliance to the finished pot. Although a popular speciality, the blue is only one of Delan's favourites. He is currently producing a very attractive pink and dark grey combination using nickel, and plain white with fine decoration in dark cobalt blue. The pots are fired at 1200° C.
Delan's work is sold mainly in St Ives and exhibited widely.